Water crisis in Maharashtra is the making of the states faulty strategy and misguided policies. A recent report, Combating drought in Maharashtra, explains how by critically analyzing Maharashtras irrigation projects, recurrent floods and water policy. Released by Dushkal Hatavu Manus Jagavu (Maharashtra Drought Forum), a network of ngos, the report is a comprehensive study of the states water scenario. While agriculture is directly related to life and livelihood of the majority of the states population, allocation for water resources to agriculture is accorded third priority in goms (Government of Maharashtras) Maharashtra State Water Policy, below allocation for industrial and commercial use, states the report. For a supposedly high performing state, the report makes some revealing observations: In nearly 70 per cent, or 27,600, of the states villages, potable water is either not available within 500 m or 15 m below the ground. Surface irrigation targets also remain unmet. For instance, the 1995 Maharashtra Water and Irrigation Commission had estimated that of the states total cultivable area of 22.54 million hectares (ha), about 8.5 million ha could be brought under surface irrigation. But the area under surface irrigation is only 3.86 million ha. The report, however, claims that even this figure is an exaggeration as only 1.23 m ha, or around a third of the potential created, is actually irrigated by canals; another 0.44 m ha is irrigated by wells in command areas of irrigation projects. A number of irrigation projects have remained incomplete for years. The report quotes the Comptroller and Auditor General of Indias (cag) 2001-02 civil audit report for Maharashtra which says that as of March 31, 2002, there were 117 incomplete irrigation projects, in which Rs 3,250 crore was blocked. The worst part is that in 14 major, 24 medium and 67 minor irrigation projects, work had been abandoned after an expenditure of Rs 27 billion because the projects had become non-viable due to cost escalation. And now to tide over the problem, the state government is trying to hive off funds from the employment guarantee scheme for projects in the Krishna basin (see Expired guarantee, Down To Earth, March 31, 2008). The state government recently allocated Rs 1,000 crore towards pending irrigation projects. Lack of surface water irrigation has impacted Maharashtras groundwater. Groundwater, primarily drawn from bore wells using pumps, accounts for about 60 per cent of the net irrigated area, claims the report. The result is 132 watershed units in the state are declared overexploitedwhere extraction exceeds recharge275 are in a critical state and another 64 are in semi-critical state. Part of the problem is the laws regulating use of water resources. Take the case of the Maharashtra Groundwater (Regulation for Drinking Water Purposes) Act, 1993. It is aimed at regulating the exploitation of groundwater for protection of public drinking water sources, not for meeting irrigation needs. Nowhere in the state can a person sink a well for any purpose within a distance of 500 m from a public drinking water source without the collectors permission. But this restriction does not apply to wells sunk by the government or local authorities to meet drinking water needs. 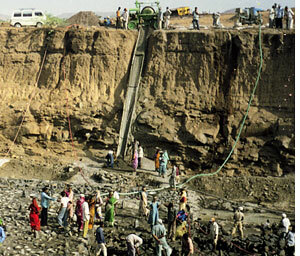 Maharashtra declared its water policy in 2003, which stresses creating incentives for water users to use water efficiently; creating water users associations with powers to manage, operate and maintain their water distribution facilities; granting water users associations entitlements to water; and creating state and river basin levels as institutional arrangements to guide and regulate water resources management. But the report is critical of the 2003 policy, which, it claims, suggests nothing radical or concrete about drought management and watershed development. It instead follows the World Bank model of entitlements. The policy recommends that transfer of water entitlements should be permitted on an annual or seasonal basis for fair compensation. This means that people who are entitled to water can sell their water. But according to the Maharashtra Drought Forum, the use of the term entitlement is misleading. Entitlement means a right, but in India there is no enforceable right to water for farmers or other water users. 1) Penalize all concerned causing delay and abandonment of the project, irrespective of the rank including political leadership.